Google is once again leveraging its online clout to push the internet forward. The most recent initiative is to encourage websites to incorporate HTTPS encryption into the website to make the internet a more secure place for users. With the recent update of the popular Google internet browser, Chrome, the search engine giant will begin to label HTTP sites as not secure. On the internet, sites currently live under one of two options, Hypertext Transfer Protocol (HTTP) or Hypertext Transfer Protocol Secure (HTTPS). 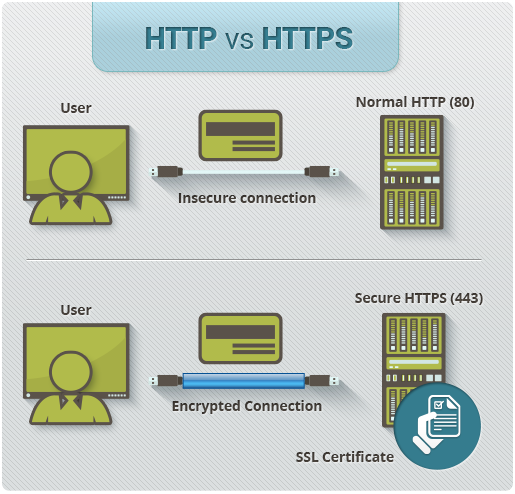 The difference between these two is that the HTTPS creates an encrypted communication channel between the browser and the website. This allows for safe communication of passwords, credit cards, and other sensitive information. HTTPS is achieved by installing an SSL certificate onto the site. In the past, HTTP sites were labeled on Google Chrome with an “i” icon. These icons were inconspicuous and did not draw user attention. When clicked, the icon alerted users that the site was not secure with the notification seen below. At the same time, HTTPS sites that utilized encryption were labeled as secure, written in green, and included a lock icon next to the HTTPS. This was a subtle way to incentivize websites to transition to HTTPS and told users that they could trust the site. Now with the update from Chrome 64 to Chrome 68, Google is taking less of a subtle approach. Google wants to make sure that it is a top priority for all websites to immediately transition to HTTPS. Users will now see “not secure” next to any website that still uses HTTP. This change will all but force any remaining websites to adopt HTTPS to remain competitive in today’s digital market. Mockingbird Marketing is here to help. Contact us today to find out how we can optimize your site to achieve your online business goals.